We’ve written a fair amount about installing baseboard and quarter round for hardwood floors, and the right finish nailer for doing this job. One recurring question from fellow DIYers tackling this project is whether you should lay quarter round that matches the wood floor or just paint the quarter round white to match the baseboard. Editors note: This article was first published in November of 2008, and it has garnered a lot of attention. We’ve learned there are several different opinions about this topic and have instituted a poll to determine the majority vote. Please read through the post and cast your vote at the end. Check out the comments, and you’ll see why people feel so strongly. Should Shoe Molding Match the Baseboard or the Floor? If you are laying quarter round or shoe molding on hardwood floors, you should lay a quarter round or shoe molding that matches the floor wood grain & stain. Most folks know that hardwood flooring companies generate a lot of profit from trim pieces. If you want to avoid paying the high price for matching trim, but still want a clean, finished look, consider buying unfinished trim pieces at your local big box and staining the to match your prefinished floor. This will save you 50-75% off buying matching trim, and you likely won’t be able to tell the difference (especially if your hardwoods are oak or pine, which are readily available in unfinished trim at home improvement stores). If you are laying quarter round on a ceramic, vinyl, or stone tile floor, you should paint the quarter round to match the baseboard molding. The most common trim color is white, and so this most often will lead to a white quarter round trim. One exception to this rule is when a ceramic or vinyl floor sits next to a room with hardwood and the quarter round continues from a hardwood area to a tiled area. Another exception would be when the baseboard is an authentic stained wood itself, in which case the quarter round should be stained to match the baseboard molding. The reason for painting the trim white is that a stained quarter round tends to draw the eye to the corner of the floor, instead of framing the floor itself. Stained quarter round on tile floors serve more as a distraction than an accent. As I said, there’s no hard and fast rule for this. Some people prefer painted quarter round even on hardwoods. Lay some sample pieces in your own room before making a decision. Don’t forget to cast your vote. You can select as many choices as you’d like, and if you want to suggest other options, send me an email. What looks better to you? What do you think? Which option did you choose in your room? Here in New England it’s traditionally painted to match the baseboard. The reason for this is the shoe mold is actually considered to be part of the “base” trim assembly. why why why does EVERYONE insist on WHITE everything? It shows dirt and fingerprints a lot, smudges from the vacuum, and has no creative bent. Not to mention, it feels like you live in a lab or hospital. While stained woods may feel tired and depressing, they can be if done wrong. So, I want to stain my doors and molding and baseboards but would like “white-er” crown molding. Would it look better if the color of paint matches the ceiling (so it doesn’t look too busy) or the walls? What color stain to use for the molding–same as the floor or….? The contractor said NO ONE stains stuff. Is he kidding. I live in New England for crying out loud. Why cover up beautiful wood. Only people who are cheap do this. White looks like a cheap tract house. 2. Fingerprints on SHOE molding?!?! 3. If dirt/dust are “hidden” if the shoe molding is stained, then you may be less apt to CLEAN ’em…hello?! 4. White is CLEAN…PRISTINE…ELEGANT and doesn’t scream LAB like you suggest. You will find it on VERY high end homes. 5. Match the ceiling? More than 98% of the ceilings are WHITE, but a FLAT white, so yeah…MATCH THE CEILING IN WHITE! I’m leaning toward painting it white to match the baseboard too. From a money and time perspective, I think it’s the right choice. We painted ours to match the baseboards also when we tore up the carpet to reveal the hardwood underneath. To me it looks like the floor is going up the walls if it’s stained. I like Todd’s explanation that if painted it’s one cohesive unit. It is referred to as shoe MOLDING as is the baseboard MOLDING. When you apply the shoe MOLDING (or quarter round), you don’t refer to it as FLOOR molding, so yeah…the MOLDING looks best if it matches the molding; base/shoe. Sorry Fred, but I’m a nay sayer too. If we were had painted trim as those above do I’d want the shoe painted to match the trim. Like Todd, I feel it’s part of the trim and should be painted (or stained as the case is in our home) to match the trim. I’m all for looks and ease. Painted quarter round is a PIA, it shows dust, dirt knicks and knocks. If you have laminate or wood floor it’s hard to paint it without getting some on the floor. Wood stained quarter round doesn’t show dirt or dust as ez. If you ding it, a little touch up stain on a paper towel does it. I even like the looks of unstained quarter round. Noticed many are leaving it off off wood/laminate floors but it always looks unfinished to me. “Marketing”? They want to sell “matching” shoe molding to put extra dollars into their pocket, sure. If s/one is bent on a stain, it’s cheaper to buy the trim at the hardware store and stain it themselves, where they can at least stand the chance of using a few diff colors to simulate a grain that comes closer to matching the flooring. Bought pine and painted it the color of the baseboard which is a very pale yellow. Fred….at least the hardwood flooring guys will be happy. The one thing I will say about painted vs stained, painted shoe molding does get dinged and marked up easier than stained molding. However, I still choose painted because of my conservative/traditional architectural preferences. First I want to say a HUGE thank you for all your hard work on this blog….I love it! Now, I am going to have to go with the majority and disagree with you and say it looks wrong…sorry, I really do love you anyway. I am just blown away. I had no idea how popular it was to paint the quarter-round. Obviously I am in the minority (the picture is from my house), but I really like the way it looks. I wonder if it’s somewhat of a regional thing? Kara, thanks for the compliment. Glad you enjoy the site. thank you so much for this article! we just bought a fixer-upper, ripped out the carpets yesterday, and i am suddenly dealing with ‘toe mold’ issues that i had never dreamed of! 😛 i accidentally voted for the wrong one above. i agree with you, to my eye it looks better to have the quarter-round match the stain of the floor. and i am really surprised to see the comments suggesting that it is old-fashioned to paint the toe-mold, i would have guessed just the opposite. thanks again, this article was a life-saver to me this morning! If the floor is dark walnut, the kitchen cabinets are golden oak and the baseboard is painted white, should I paint the quarter round against the baseboard white and stain the quarter round under the kitchen cabinets? If so, should I stain that quarter round the color of the cabinets or the floor? @Donna, Did you put walnut in your kitchen? Or are these different rooms? It depends on how each room is connected. If the quarter-round is separated by things like door-jams it’s easy to paint one area and stain another. If the quarter-round flows from one room to the next, I think painting it all white is the way to go. It provides consistency between the rooms. If your kitchen has walnut floors I would paint the quarter-round white to match the baseboard rather than highlight one stain over the other. Try out the different scenarios to make sure you like the end result. I guess I’m in the minority too! I love the stain grade so much, I’m getting ready to do it in my house!! Thanks for all the comments. Oh, I’m in Texas, maybe that accounts for my taste. I have both the white and matching quarter round for hardwood as it seeems I have different tastes in different rooms. Frankly, I prefer the quarter round to match the solid 3/4 hardwood floors or to be a shade darker. I say it is up to you. Just like some like a brad nailer for quarter round, I use a stud finder and a finish nailer. It is your home. Do what you like and what you feel comfortable with and have the time to do. White quarter round does have an advantage if your other molding is white. It is easier paint the molding above the quarter round without being an expert painter. I am struggling to figure out what to do. I have already made a deposit on Brazilian Cherry hardwood. My living room is paneled with dark paneling – probably the color of walnut. The living room merges into a foyer that is a painted sheetrock wall. What do I do in this situation? Lets take the living room first – what color of quarter round and baseboard should I use there? Now the adjacent area that is painted sheetrock – what color of quarter round and baseboard should I use? How about one more question: The living room goes into a kitchen that I plan to tile and a dining room is off of the kitchen. The dining room will be in the same Brazilian Cherry hardwood. This is a painted sheetrock room. What quarter round and baseboard would be good here? Thanks very much. I have been putting off getting the job done because of this issue. This recently came up in conversation with a friend. I chose to go with the stain (shoe mold is the color of my wood floor) and it looks really nice; she says it should be white as are the baseboards. To me, that looks as if the basboard is leaking onto the floor. Thanks for the blog. From Texas. Actually like like both approaches depending on the room. In the house I am building for my family it will ,match the pine flooring whatever color it may be. Even that will vary from room to room. We like color on the floors and walls. Definitely a personal choice. 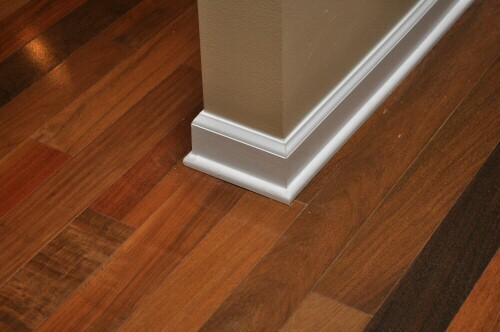 I’ve seen the shoe molding painted to match the baseboard as well as stained to match the flooring. They both looked good. I think here it depends on your preference. Is there a problem with painting stained trim and molding white? Is it better to keep the trim including baseboards, door and window trim stained? Are there any advantages, aesthetically or otherwise, to having trim that is white as oppposed to trim that is stained? Stained wood trim is pretty much out…at least it’s not “in” like it was back in the 80s/90s. Our home had wood stained dental molding, window molding, door jambs, and EVERYTHING. An UPDATE was needed years back, and we painted ALL of it! It freshens it up…looks much cleaner, up to date and so forth. 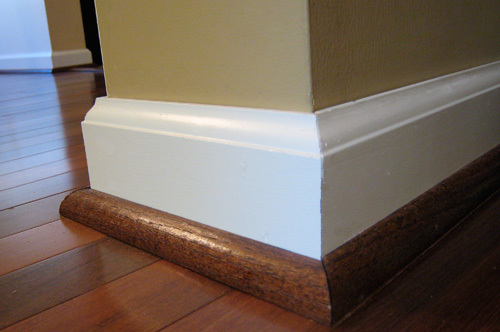 Look at most any site like Houzz, Pintrest or simply query pics of baseboard trim on hardwoods and you’ll see a HUGE majority of the pics where the shoe molding is PAINTED, and generally White. Painted dental molding or w/ever you may choose up at the ceilings makes your room appear MUCH larger, and the walls taller. There’s no more defined line around the perimeter of the wall that delineates the walls from the ceiling. When shoe molding is stained like the floor, it makes it appear as if the floor is creeping up the wall like a vine! By the way, you WALK on your floors, NOT your baseboard. Also, it is TRIM…TRIM, not flooring. I usually use a white painted quarter round. However, Once I remeodeled a bathroom and I palced a stained quarter round that matched the stained baseboard that I used from another room. It was great. I still get comliments on it everytime soembody look at it. It brings warmth and class to the room. I have a similar question that I have been struggling with for several months and so nothing has been done. I tiled my kithen and matched the baseboards (no quarter or half round) to the chair rail and cabinets which are a medium cherry. Now in the living room, hall and area that connects to the kitchen, I have just laid down a natural Amendiom hardwood. My questions is: how do I proceed with the baseboards? The Cherry is much too red for the Amendiom, so I don’t think I want to use that. If I wanted to go with painted white or matching a stain to Amendiom, how do I decide where to cut off the Cherry baseboards and switch over to that? Is that even ever done or should the whole house be the same? Any help and thoughts would be appreciaed. This is a very personalized decision, but in your case I would probably paint all the baseboards white. In one of our friends houses they have wood trim throughout and it severely limits which hardwoods can be installed. If you go white, you’ll eliminate the issue. The other option is to pick a matching hardwood, chair rail, and baseboard so that everything matches. Alternatively, if there is no visual link between the two rooms, maybe keep the wood trim in the kitchen and put the white baseboards in the other room. That said, I’d prefer white in your situation. I too am in the minority (quickly becoming the majority). I’ve owned 2 “older”, turn of the century” homes here in Dallas…hardwoods throughout. In my last home, my quarter round was painted to match the base moulding. In my current home, i elected to stain the quarter round to match the floor and i do not regret it. In my opinion, a dark stained quarter round against the white base moulding (in my house) adds a more formal look and really dresses up the room. If i had a combination of tile, carpet, hardwoods, etc. i’d probably paint my mouldings throughout but with hardwoods throughout (and in an older home) i think it is a much better look. just my 2 cents…. Shoe molding is attached to the baseboard assembly, so it should be the color of of the baseboard. To me it seems illogical to make a piece of molding look like flooring. I started trimming custom houses in Ohio and installed 2,3,4 and even 5 piece baseboard. When I moved to south carolina I was very supprised to see stained shoe on painted baseboard, to me it looks tacky. Floors are supposed to be flat. But that is my two cents…. I am really struggling with this issue. We are getting hardwood floors in our entry, family room and kitchen. I prefer to match the shoe molding to the white baseboards, but what do we do in the kitchen where we have oak cabinets. The white molding would just stand out. Also we have some white baseboards in between cabinets where our pantry is located. Should we just go ahead and match the molding to the floor? help!!! Why would you “struggle”?! 2ndly, any FLOORING is horizontal…the TRIM is VERTICAL. You WALK on the wood flooring, but the TRIM is an accent piece to the baseboard molding already in place. I always match my shoe molding to the baseboard. If your are putting shoe around a cabinet, I would stain the pieces of shoe molding to match the cabinets. Make sure you use the same type of wood as your cabinets (oak. maple, hickory etc.) so you get a professional look. Also I cope my shoe molding and the results are always better than just 45-ing the inside corners. Oh, I’m so glad to find this article. I’ve been pondering on which to use too. I just pulled up carpet and found these beautiful oak hardwoods. A guy who built me a closet in a spare room, said I should stain the shoe molding. Well, I’ve looked around and see alot have theirs painting. Then someone said if I stain it, I should buy the oak shoe molding. Well, I’m wanting to get this done before a bunch of bugs may get in during winter – don’t know if they will, but it is a concern of mine. One thing is 2 rooms are stained the same; had been refinished. Then there’s the spare room that’s a little darker but beautiful, and the middle room is yucky, and darker (maybe nothing had been done to it, but waxed). So, when you stain the shoe molding, it might look funny if it’s not the same stain? I’d hate to buy 2 different stains to do these. But the extra bedroom is a notty pine paneling, so it would have to be stained. Which stain should I buy? I may be leaning more on painting the other rooms to match the trim. I may decide to try to sell the house later, and purchase another one. This is an older house built in 1950. So I wasn’t, at this moment, wanting to spend alot more money on it. Oh, I just read a few more responses, prior to my comment. It seems the men are leaning more towards the stain – is there a reason? I haven’t read all comments yet. Now I’m definitely more on the fence about it… I am starting to see it more the way Dave H. does (match the shoe molding or quarter round to the baseboard). For kitchen cabinets, I think it is appropriate to match the cabinets. For paneling, I would try to find shoe molding that matches the baseboard. I also might paint the paneling…. Well, thanks for all the info. I do plan on getting it stained where the room is notty pine paneling (wished there was a man around to pull it down and put up sheetrock, but I won’t be doing that – seems alot of men like this room though). OK, got someone to put it down for me, but he said not to paint the shoe molding until he put it down. I was getting the already primed kind – so that might work for me. Then the room with the notty pine, I’m at a loss – but I will stain it…just don’t look forward to doing it though; it’s getting colder here. Painting the notty pine: Well, I had a friend do that and we even primed it – she said it started to bleed thru. So I didn’t want to paint this room. The other room I had that was just regular paneling, I did paint and love it so much better! Isn’t the original purpose of quarter round to protect the baseboard from getting nicked, scratched, etc? So why would I paint the quarter round white, just so it can be nicked and scratched? Aren’t I just going to end up painting the quarter round year after year? I’m so struggling with this. I have ceramic tile (yuk) in my kitchen, white baseboards and no quarter round. I know it will look bad to add a natural colored wood quarter round to the mix, but I don’t want to end up painting the quarter round every year. Currently I have carpet and stained baseboards as well as stained trim around doors and stained doors. We are having all carpet taken up and hardwood installed. My question is, I love the look of white baseboards, but it is very costly to replace the doors and door trim…my installer insists that it would not look bad if I go ahead with white baseboards and leave the doors and door trim as is. Right now it does match the color of my cabinets and stairway handrails, but I can’t picture the rest of the house trim white without replacing the doors etc. Would greatly appreciate any thoughts! In my opinion all your trim should match. I believe this gives a more finished look. If I were in your situation I would buy shoe molding (same wood species as the rest of your trim) and hire a good painter to match the color of the stain. After it is stained sealed and has its coats of poly. all that needs done is to be installed, which you could easily do yourself. Just take your time. I just did cherry shoe molding in my front entrance way. It matches the floor. It looks great. My white baseboards are 8 inches high. The height of the baseboard my be a consideration when choosing to match the floor or the baseboard in color. I tend to agree with this. In the pictures, I think the stained looks huge compared to the height of the baseboards so the painted looks better. However, I have an early 1900’s Craftsman styled house with 10 inch baseboards. We just ripped up the carpet in the two main rooms and refinished the oak floors. The stain we used in a midtone with reddish highlights. We are using stained quarter round since it does not detract from the tall, white baseboards. We also live in a plains state with lots of dust and white quarter round or shoe molding looks very ugly very fast here! I Own a flooring Company in Florida and with all our installs we add in for shoe molding instead of quarter round. I think quarter round looks tacky unless the base board is over 3 inches . shoe molding is also cheaper and saves the home owner money .We always paint shoe mold to match base board . 9 out 0f 10 is white. Further to my Dec 17, 2008 post, I followed through with the stained molding. I used it n the wood floors in the living room, formal dining room, and halls, carried it through the tiled kitchen, breakfast rooms and bath rooms, and finally through to the wood floor den. The results were fabulous! Friends and my realtor love it! I really appreciate all the valuable comments on this website. Remodeled my house 5 years ago. No quarter round was mentioned by the subcontractor. We went with white baseboards and a chestnut stain on the original oak floors and caulked and painted the gaps. Thinking of adding quarter round. Why do people use quarter round? You have to caulk both at the bottom. I have stained the quarter round but found that the stain at the cuts absorb quicker than the actual piece. How do I match the stain at the cut? Kathy – probably not an easy way to fix this, since wood absorbs stain more when it is put on across the grain rather than with it. Are the cuts visible? We are in the process of building and wanted stained baseboards, trim and interior doors. We are not going to be able to have solid wood doors due to the budget. Would it look okay to go ahead and stain the baseboards and trim but paint the doors? Our floor is stained concrete. I agree with Dave H and others in that shoe molding is part of the MOLDING, not the floor. I live in a mid century brick rancher that I inherited from my grandparents in North Carolina. They built this house themselves – and I mean with their own hands and those of my two great-grandfathers. The molding is 8 inches with shoe molding, plus a cap piece of molding on the baseboards. The home has hardwood throughout, with the exception of wet areas. In the rooms in which the baseboards are painted, ALL of the trim is painted, because the pieces belong to each other. In the rooms that the trim is stained, all of the trim is stained. I’ve been in new homes around Raleigh and have seen stained shoe against painted base – and it looks cheap and as though the floor is climbing the wall. And it makes your baseboard assembly look smaller – which is not usually a goal, is it? Dave D: I agree 100%. My little house is an older house and I chose to paint the shoe molding the same as the baseboard molding. I do have one room that has notty pine paneling and I stained it to match. Great hearing from another neighbor from NC – I’m in Greensboro. Shoe mold is not part of the base. Its a transition strip. Never in greek or roman architecture would you ever see a shoe mold. Even in classic homes like Mount Vernon or Moticello will you see a shoe. But it evolved in wood contruction because its very tough to get a tight transition from the base to the floor. Architects and builders started adding small shoe shaped molding matching the wood floor to cover the gaps. Today since craftsmanship isnt what it once was..larger profiles are used and it is easier to paint the base and shoe than to take off the shoe to paint the base. Even in old houses with orig shoe..if you scrape off the paint you will find a stained wood matching the orig floor. Stain is traditional..but hey..if you want to use a large profile and paint it go ahead. If you put the floor boards in after you put in the floor, you wouldn’t need the quarter round right? Quarter round messes up bookshelves—offsetting them too far from the wall. It should match the floor colour. But I just love the finished wood rather than paint. I still think it looks odd to have the shoe molding match the floor. Painted here! It must be a regional thing. I’m in the “shoe is the same color as the base” camp but it’s personal preference. I’m redoing all of the door and window trim in my house and going with an Arts and Crafts style built up casing. The shoe adds to the built up effect for me. I voted for painting the shoe to match the base, but that is my preference. At the end of the day, I think you need to do in your house what works for you. I’m a fan of stain and would prefer the baseboard and the shoe be stained. However, if you already have painted baseboards, especially the low end as found in my condo, paint is the way to go. I have no quarter round in my house… but I probably should, since I have hardwood floors. My house is a 60s ranch, so it has pretty stark trim. I personally prefer much more traditional trim, but I don’t feel it would fit the house very well. That being said… I much prefer the look of painted quarter round (and trim). I also prefer trim to be white, so throw me in with Todd as being a traditionalist. Ours match the stain of the wood. I think the stain looks better IMO. We’ve done our new installation painted to match the baseboard, but in the rooms where HW was already installed for the past 40 years, it’s stained to match the floor. Now that I’ve had both, I prefer it painted to match baseboard. From Texas – I prefer the quarter round to be painted the color of the baseboard trim. In our old house all of the quarter round was painted the same color as the baseboards with wood floors with a medium-dark stain. Maybe my eyes got used to this look. In our new house all of the quarter round is stained the same as the hardwood floors. It has always looked odd to me. I just finished installing/replacing a laminate wood floor in our den. I’m going to paint the quarter round the same color as the baseboard. Slightly off white. I agree with one of the commenters, that when you stain the quarter round, it looks like the floor is running up the wall. After reading a lot of the comments, I say it’s 100% subjective. How the shoe mold will be nailed is a factor to consider. 1) If the installer nails only into the baseboard then painted or stained work well because the seam between the shoe mold and the baseboard remain tight. 2) If your installer is an old school craftsman and reads Taunton’s Press’ books and magazines they may follow those references directive and nail the shoe moulding to the floor. Pre-finished stained shoe mold is better in this scenario. The floor and baseboard move appart due to humidity and an unsightly crack or space will develope at the seam between the shoe mold and the baseboard. This space/crack is less obtrusive when a stained shoe mold is against a painted light colored baseboard. 3) I personally prefer baseboard with poplar wood shoe mold nailed to it and then both painted white at the same time for a long lasting, crack free, crisp look. From SC – Our baseboard is painted off white and our shoe molding is stained walnut to match our hardwood floors, except in the bathrooms where we have tile flooring. In my opinion, this gave the house a more elegant look. But if you are going for country or contemporary, or have shorter than a 6 inch baseboard height, matching the trim may be the better choice. I guess personal preference is the deciding factor. Glad i found this site. i just had hardwood floors installed by a big carpet discount place and they used the stained shoe molding. I didnt give it much thought while they were installing but now when I look at it it seems like a big tray or curb if you know what I mean. I will probably pull it all off and re do in white. I prefer staining the shoe molding to match the floor. Painted molding shows the dirt a lot more and requires more maintenance. I like the baseboard and quarterround to match. However, if the hardwood floor is butted up against a masonry hearth, the quarter round should match the floor. My question and dilema; our kitchen island only has a base plate now, our new flooring is much lighter than the island cabinets and the kitchen cabinets. Should the quarter round be stained to match the cabinets to give it a finished furniture look, or should the quarterround match the floor? Thx. Just put down Brazilian Cherry hardwood floors in 2 rooms. in the living and dining room connected, I did the small door transitions out of the wood itself. the heights were very close to even and with a little manipulation they worked out fine. however in my den I have a fireplace that needed a reducing transition border, and I have a long 8ft opening that leads into the kitchen that required T-molding. I bought unfinished oak trim in both cases and made all the cuts(picture framing the ceramic tile around the fireplace. My problem is finding the right color stain or paint to look good and act like a border or be similar or to the Brazilian Cherry. My problem with all the stains is that they are too thin and when more coats are added they just don’t look like a good match or border. Please, please, please give me help and advice. this is the only piece left on this project. First of all wood should not be painted. Its unique character should not be hidden with opaque pigmentation. Four reasons why it gets painted is: it is plastic, the builder used finger jointed molding, the previous owners did it or the staining procedure is too challenging to the installer. Painted wood always looks as if it is artificially “embellished” to appear sophisticated, when actually staining provides a timeless classical look. When viewed for comparison, the dilemma for the viewer is because that person is already biased by the existing painted molding. The real comparison should be between all stained molding or all painted molding. I never prefer coverups over the wood. Painting wood is more contemporary in style, but it is still done by those who think it’s classical but have been actually deceived by there preconceptions of what is right. I agree with Fred! Look at it from a practical point of view. What function does a shoe molding provide? How many white shoes leave scuff marks unless it’s a black floor? What common colors are boots and shoes? This can be debated, the shoe molding butts up against the wood floor, it should match the floor. 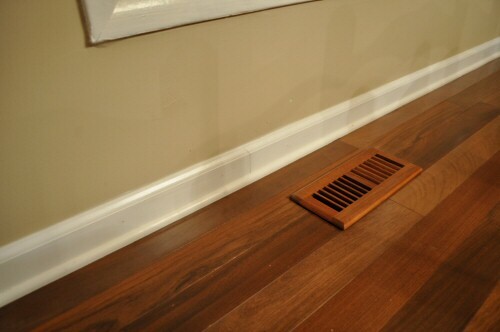 It suits it’s purpose and protects the above baseboard. I have to go with shoe molding should not be painted. Now this is just my opinion but this is what I think has happened…. Once upon a time shoe molding (and the insides of wood windows for that matter) were never painted, they were the natural wood color (or stained/oiled) but then people started painting molding (remember molding for the longest time was never painted) and they didn’t always know what they were doing and they painted things they shouldn’t have. So shoe molding was painted one time and then the next guy who owned the house, well he saw it it thought it was supposed to be painted and so on. Same thing with the insides of wood windows…they were never supposed to be painted, but many, many homeowners did and then those wood windows stopped working so well, and people hated them. Well of course they did – they were all gummed up with paint! Every old house that I have rehabbed and sold I’ve removed all the painted shoe molding and rehabbed all the wood windows in hopes to pass on this info….But hey if they went in and painted it…that’s ok.
We tore out an entire house of carpet and tile and installed oak hardwood flooring. Our trim is painted a high gloss white and we bought shoe moulding and stained it to match the hardwoods. It turned out beautifully. We never thought of painting the shoe moulding white as hubby does interior trim and in our area of Virginia shoe moulding is always stained to match the hardwoods. It gives such a finished look to the floors without that stark white against the floors. I’ve seen painted white shoe moulding and think it looks pretty bad not to mention the scuffs and nicks of a vacuum cleaner. Hi, I just found this site, so really hope it’s still active. I recently pulled up all the carpet in our 1836 Colonial home. The floors are pine . The 8 inch baseboards were painted but I took them off to sand back to natural wood. My dilemma: If my walls are painted soft ivory and the floors are finished in a golden color then what is going to work for the baseboards? I’d planned to stain them darker than the floor color and install shoe moulding at the base stained the same, but now not so sure. There are 4 doors in this office room to consider too. I’ve sanded them all down to stain as well with a darker color. There’s a staircase in this room too. I’m stressed over what to do with the baseboards and trim and door frames now. Oh and the doors…..should I stain them to match the trim around them ? I really love the wood and spent so many weeks removing all the paint . Any input sure would be welcomed. Thank you. Funny how divided this is. It’s nice though as everyone can do what they please for the look that they are going for. When we purchased our house it had wood floors on the main floor. The shoe trim molding of course matches the oak floor. When I did oak floors upstairs I did not use any shoe molding and simply took off the baseboards and put the flooring to the wall then attached the baseboards. This is a much cleaner look. However, I can’t do this down stairs since the installers/builder went cheap and ONLY installed the wood floor to the baseboards. I’m at the point now where I am touching up everything in the house and painting all the white trim pieces (window/door frames) a nice bright pure white. It really freshens and makes it look new. This has brought to my attention how much I dislike the oak color shoe trim molding that is on the baseboards. It not only makes the baseboards look smaller (and they are already too small in my opinion) but it makes the floor look like it’s creeping up the wall which at first I was OK with but now after painting I really dislike. I plan on painting all the oak shoe molding white to match the baseboards for the same reasons mentioned previously. It will make the white baseboards appear bigger/more detail and have the floor be just that, the floor which isn’t creeping up on the wall.